MainAll NewsInside IsraelUTJ: New Government 'Hateful, Evil, Corrupt,' etc. UTJ: New Government 'Hateful, Evil, Corrupt,' etc. 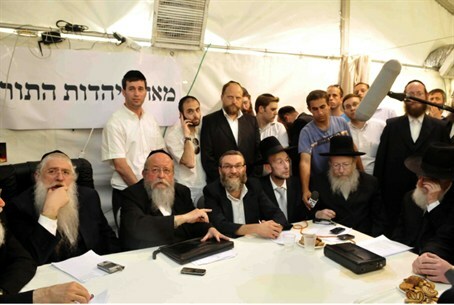 MKs of the hareidi United Torah Jewry slammed the new government, heaped invective on its members, and expressed their wishes for its rapid demise at a meeting Wednesday night. In a meeting summing up the the party's efforts to join the government, and its ultimate failure to do so, MKs called the new government “disloyal,” “corrupt,” “hateful,” “evil,” and more. MK Ya'akov Litzman, formerly Deputy Health Minister, said that “this is government based on corruption, hate, boycotts, divisiveness, and dissension. Yair Lapid and Naftali Bennett plan to inflict damage on the holiest parts of the Jewish nation. We will remain in the opposition, actively fighting with all our abilities to topple this evil government. “This is a new era, in which Israelis will be under a sword of budget cuts that will damage the welfare of all Israelis, and especially the poor. UTJ will represent the majority of the Jewish people with strength and pride, protecting them from the damage Lapid and Bennett will do to religion, values, and the survival of poorer Israelis,” Litzman said. MK Yisrael Eichler was more optimistic about the future. “This is a 'time of trouble for Jacob,” he said, using a term traditionally employed for major dangers to the Jewish people. “But I am sure we will be saved. This is an 'edict from Heaven,' and these things always turn out well. Even a situation like this, where we must remain in the opposition and fight against a secular government that will try to damage hareidi education, can be positive. This is a government where the High Court has taken control of the lawmakers of the Knesset, and at least we will not be a party to their edicts. “We will fight them in the traditional way Jews have fought: With bribes, prayers, and war,” Eichler said, referring to the Biblical story of Jacob meeting his brother Esav. David Ben Gurion, the secularist first Prime Minister of Israel, “was stronger than they are, and hareidi Jewry was much weaker then. Even he understood that hareidi education could not be compromised. The current leaders will learn the same thing, the hard way,” he added.